← Are scientists arrogant, close-minded, and dismissive? Many people are under the false impression that evolution is always beneficial, but it can actually be quite harmful. This is especially true for evolution via genetic drift. Like natural selection, genetic drift removes variation from a population, but unlike selection, it is random and it can remove beneficial traits. Indeed, we often become so focused on selection that we assume that all of the features that we see in organisms were selected because of some beneficial role, but that is not true. Some of those features arose via the random process of genetic drift, and at times this process can even swamp natural selection and cause harmful traits to rise to prominence. In other words, evolution via genetic drift can actually be very detrimental to populations. So in this post, I want to talk about what this mechanism is, how it works, and how it interacts with the other evolutionary mechanisms. In its simplest terms genetic drift is just a random change in the allele frequencies of a population over time. This is in stark contrast to natural selection, in which the change in allele frequencies is not random (it is a common misconception that natural selection is random). Remember, evolution is simply any change in a population’s allele frequencies over time, so the key defining feature of genetic drift is that this change is random. The obvious question is then, what causes allele frequencies to change randomly? There are several answers to that question, but the classic answer (and indeed the one that is constantly at play) is the random nature of independent assortment. This is a simple illustration of the coin simulation. Each circle is an allele, and each pair is an individual. The lines show which allele gets passed. So the individual on the left in generation 1 happened to pass an H to one offspring and a T to the other, whereas the individual on the right randomly passed an H to each. As a result, the individual on the left in the second generation had two Hs and could not pass a T. The individual on the right could have passed a T, but two Hs were randomly selected instead, so by the third generation, H had become fixed, and the T allele was lost. Because which chromosomes you pass on is completely random, the allele frequencies can shift overtime if, just by chance, one chromosome happens to get passed more than the other. I’m going to use a simulator to illustrate this in a minute, but for now, let me illustrate with a coin (if you have one handy, please grab a piece of paper and try this yourself). First, assume that you have two individuals, each of which is a heterozygote, meaning that they have one copy of each allele (which in this case will be heads and tails). Now, to make the first individual, flip the coin twice, and whatever it lands on, that will be your first offspring. The first coin flip represents the allele from parent 1 (i.e., there is a 50% chance of passing H and a 50% chance of passing T, just like in independent assortment), and the second flip represents the allele from parent 2. Now, do it again to make a second offspring. 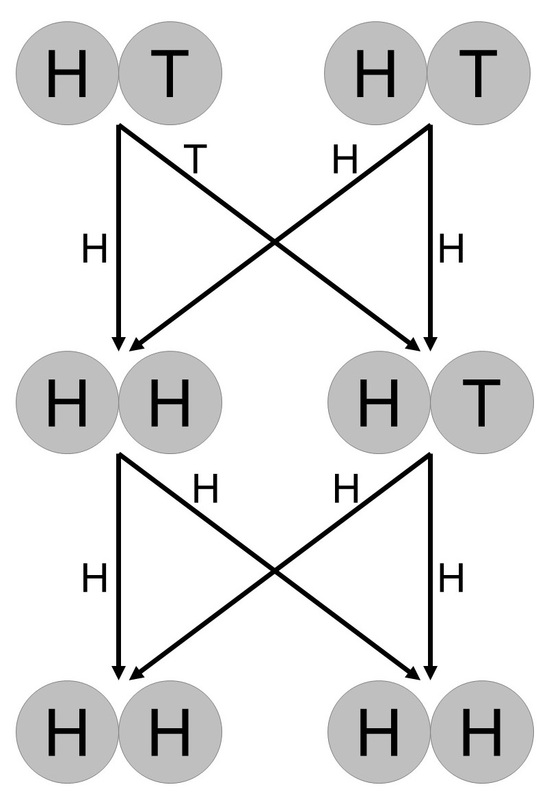 There are only six possible outcomes: both TT, both HH, both HT, one HH one TT, one HT one TT, one HT one HH (TH and HT are the same). Write down your first two offspring, then “mate” them. If both of your offspring are HT, then the procedure is identical to what you did before; however, if one of them is a homozygote (i.e., only has one type of allele), then it can only pass on that allele (i.e., a TT can only pass T and HH can only pass H, thus if your offspring are TT and HH then both grandchildren will be TH). Make two more children in this manner (e.g., if you have an HH and a HT, then each of your two new individuals will receive an H from the HH parent and either an H or a T from the HT parent, flip the coin to decide which). Keep flipping your coin and making new generations like this, and you will pretty quickly get to a point where one of your alleles disappears and all that you have is TT or HH. At that point, we say that the allele is “fixed,” meaning that one of the alleles has been lost, and every individual in the population is now homozygous for the other allele (i.e., has two copies of it). The first time that I tried this, it only took five generations for one allele to become fixed, but if you do it numerous times, you’ll notice that the number of generations until fixation varies, and if you do it enough times, 50% of the time heads will become fixed and 50% of the time tails will become fixed. What you have just done is simulate genetic drift. That’s really all that it is. Random chance produces slight variations in allele frequencies until one allele eventually becomes fixed. The image on the left illustrates the situation more clearly. It shows genetic drift in a population of 100 individuals. As you can see, the allele frequency randomly oscillates up and down until eventually the dominant allele becomes fixed. If you think about the math behind genetic drift, you would intuitively expect genetic drift to be more severe when population sizes are small, and indeed that is exactly what happens in nature. In fact, at very large population sizes, we expect genetic drift to have a relatively small effect. To illustrate this, I used a simulator to simulate four different scenarios (illustrated below). In each situation, I simulated 10 populations that consisted of 2, 10, 100, or 1000 individuals, and each population started with even allele frequencies for the gene being simulated (i.e. half of the alleles were dominant and half were recessive). As you can see, when there were only 2 or 10 individuals in the populations, alleles became fixed very rapidly (the simulations with 2 individuals are the same thing as what you did with a coin). 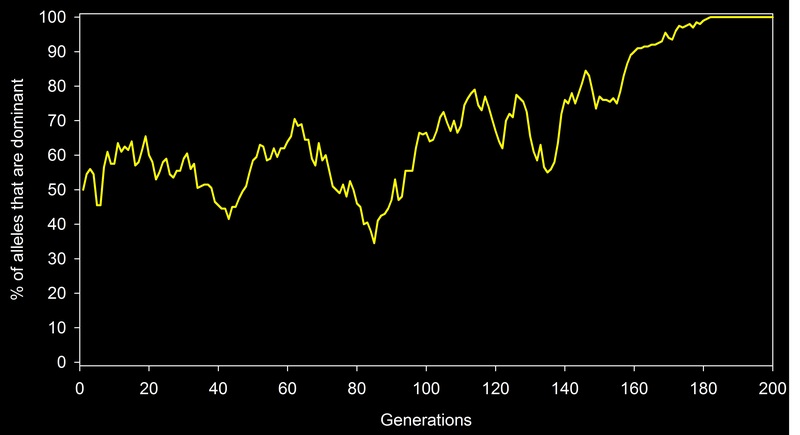 When the population size jumps up to 100, however, things are more stable, but by the end of the 50 generations shown, you can see that some populations are trending towards having fixed alleles, and indeed after a few hundred generations all of the populations became fixed (not shown). Finally, the populations with 1000 individuals retained fairly stable allele frequencies, but even in those cases, alleles will eventually become fixed unless they are acted upon by another evolutionary force, and, in fact, in natural populations, those other mechanisms (particularly gene flow) do often interact with genetic drift and prevent the fixation of alleles in large populations. 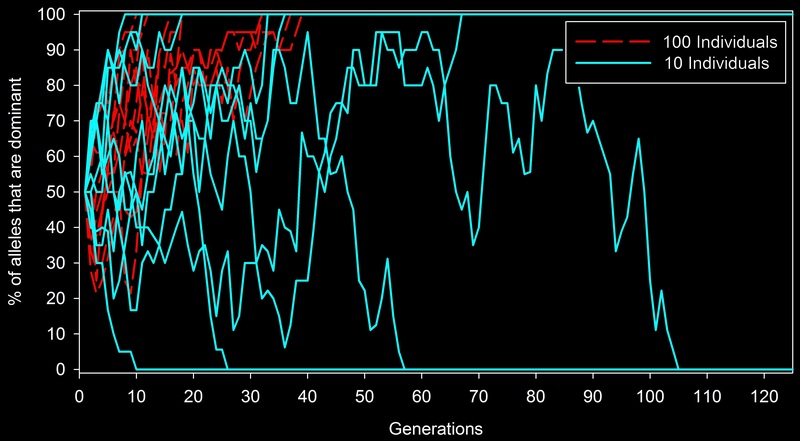 Note: the next post in this series will be entirely devoted to gene flow, so I will talk about how it interacts with genetic drift in detail there. Each line represents a different population, and as you can see, when those populations are small (red and blue lines) the alleles become fixed quite rapidly. When talking about genetic drift, we are often talking about neutral alleles (i.e., alleles that are neither beneficial nor harmful to individuals); however, it can occur for alleles that are not selectively neutral. Imagine a situation where half of the alleles in a population for a given trait are dominant (A) and half are recessive (a); however, the environment changes, and as a result, individuals with a dominant phenotype (i.e., they have at least one dominant allele, so they are either AA or Aa) survive to a reproductive age 100% of the time, whereas individuals with a recessive phenotype (aa) only survive to a reproductive age 90% of the time. In other words, there is selection against the recessive allele, because it reduces an individual’s ability to reproduce when two copies of it are present. Now, you should intuitively expect that natural selection will act on this situation and remove the receive allele from the population, and when the population is large enough, you would be correct. However, when the population is small then, depending on the strength of selection, genetic drift can actually overpower selection. Each red dashed line shows a population with 100 individuals, and each solid light blue line shows a population with 10 individuals. 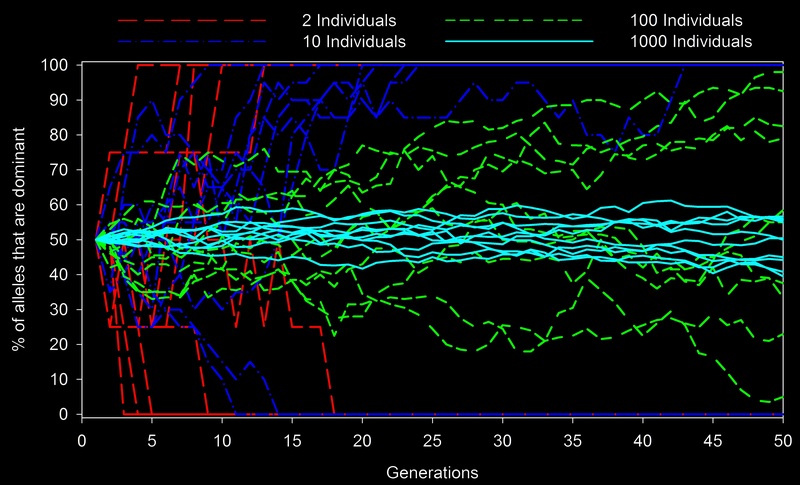 Even though populations that are 0% dominant have lower survival (in these simulations), genetic drift still caused several of the small populations to lose the dominant allele completely. To illustrate this, consider the figure on the right. I once again used the simulator to simulate 10 populations with 10 individuals and 10 populations with 100 individuals, but this time I set a selection differential so that all of the AA and Aa individuals would survive to a reproductive age, but individuals who had two recessive alleles (aa) only had a 90% chance of surviving. As you can see, in all 10 populations of 100 individuals, selection removed the harmful allele and fixed the beneficial one. In four of the populations with only 10 individuals, however, the populations were so small that genetic drift overpowered selection and actually caused the recessive allele to become fixed! That is a really bad situation because, barring any gene flow or mutations, those populations are now stuck with the harmful allele, and the overall survival of those populations is 10% lower than the survival of populations that managed to rid themselves of the harmful allele. As I’m sure you can imagine, this has extremely important implications for wildlife conservation efforts, and it is one of the key reasons that conservationists are so concerned with maintaining large numbers of individuals. When populations are small, genetic drift can cause harmful alleles to rise to prominence or even become fixed, and that is a very bad thing for the survival of those populations. It should now be clear that genetic drift removes variation from populations. Indeed, in many of the simulations that I have illustrated you can see that one of the alleles became fixed while the other was lost from the population. This is important because it means that, just like selection, genetic drift is constantly causing populations to become less diverse. As a result, populations are heavily reliant on gene flow from neighboring populations (which can restock their genepool with alleles that they had lost) as well as mutations (which are the only mechanism that is capable of making new variation). Even when the alleles that are lost are neutral, this is often a serious problem for populations in the long run. Remember, selection simply adapts organisms to their current environment, so although an allele may be neutral at the moment, it may become very important if the environment changes. Indeed, a high level of genetic variation is one of the key factors for determining whether or not a population will survive changes in the environment, the introduction of a new disease or predator, etc. Now that you understand the basics of genetic drift, I want to introduce you to two final concepts. The first of these is a genetic bottleneck. Bottlenecks are often considered to be a type of genetic drift, but they act a bit differently from the type of genetic drift that we have been talking about so for. In bottlenecks, a large number of individuals is rapidly lost, and as a result, the genetic variation is reduced to a small subset of what it was before. Image, for example, that there is a large population of frogs living at the base of a volcano, and 80% of the frogs contain an allele for green pigment while 20% contain an allele for brown pigment. Then, the volcano erupts and kills off 90% of the frogs. Further, just by chance, all of the frogs with the allele for brown pigment were killed during the eruption. This is, therefore, clearly a case of instantaneous evolution by genetic drift because evolution is a change in allele frequencies, and the allele frequencies change from 20% and 80% to 0% and 100%. Additionally, this would likely represent a genetic bottleneck because it is likely that many other alleles were lost as well. Indeed, one of the characteristics of a bottleneck is the loss of many rare alleles. Finally, the effects of a bottleneck are largely determined by how many generations it lasts for (i.e., how long the population remains small), because as you recall, small populations have greater genetic drift. So even alleles that survived the volcanic eruption may quickly be lost due to genetic drift, if the population does not grow rapidly. At this point you may be wondering when it is appropriate to talk about a bottleneck as a type of genetic drift, and that is honestly something of a grey area, with some people/books preferring to entirely separate the two, while others lump them together. I personally think that the best way to think about this is to remember than genetic drift is a random change in allele frequencies. So, if the bottleneck killed individuals randomly (i.e., no individuals had alleles that made them more likely to survive the eruption) then it is ok to talk about it as a type of genetic drift. However, if something kills many individuals but does so by selecting its victims, then it should really be thought of as a natural selection event. For example, if a disease outbreak kills off 90% of individuals, and only the 10% of individuals that had alleles that made them resistant to the disease survived, then that likely would be a genetic bottleneck, but it would not be genetic drift because the survivors were selected rather than being chosen randomly. Genetic drift could, however, come in to play in the following generations if the populations do not recover rapidly enough (i.e., they remain small). On a side note, the recovery of populations from disease outbreaks and whether or not the outbreaks caused genetic bottlenecks is actually a key focus of my current research. A founder effect is really just a special type of a bottleneck, and it occurs when a new population is formed from a subset of the original population (i.e., the new population only contains a small portion of the genetic variation found in the original population). For example, let’s go back to our population of brown and green frogs, but this time, instead of a volcano, imagine that they live on the edge of a lake, and one day a storm blows several of them out to a previously uninhabited island. However, all 10 of the individuals that form the new population on the island contained only the allele for brown pigment. We would describe this as a founder event, because the new population is limited to the genetic material contained in the individuals that founded it (e.g., the green allele is not present in this new population), but it often also presents a bottleneck, because these new populations usually only contain a small portion of the variation that was in the source population. In summary, genetic drift is simply an evolutionary mechanism that causes random changes in allele frequencies over time. It is most powerful when population sizes are small, and in some situations it can actually cause harmful alleles to become fixed in a population. As a result, it is a major concern for conservation efforts, and it is one of the reasons that conservation biologists place a high priority on maintaining large populations. I just found your blog the other day (I think through Science-Based Medicine) and am so happy I did! I’m a student of chemical engineering, with an emphasis in biochem, and I haven’t yet had the pleasure of taking genetics. This was super informative, and I loved your entire series on evolution. Your blog is wonderful, and I love the systematic way that you cover your topics. It is both thorough and accessible, which I really appreciate. And I LOVE your statistics series as well. It is so, so, so helpful. Thanks so much, and keep up the good work! Just found your blog and I’m loving it! I’m doing a Coursera course in Genetics and Evolution at the moment and your posts are complimenting it nicely. Also just finished another course in Logic and Critical Thinking with FutureLearn, and enjoyed your posts on same. Serendipity? Now following you on Facebook. Thanks for writing. For me this was explained nicely. Please be aware that you are being way overly simplistic. If there is gene interaction then a population bottleneck can increase genetic variation. This has been mathematically modeled, and experimentally confirmed. Interestingly there have been a few occasions where a bottleneck has been used to kickstart a selection program that was not working. Bottom line: Genetic drift is very boring until you add gene interactions. I don’t really think it is fare to describe this as “way overly simplistic.” I would say that is way overly critical. Sure, gene interactions do occur and effect how things play out for a subset of the genome, but this post was intended simply as a general overview, and you don’t need to understand gene interactions to understand the fundamental concepts of genetic drift (pick up any introductory evolution or genomics text book, and look up genetic drift, you won’t find anything on gene interactions because those aren’t important for understanding the overarching patterns). Can you please provide a citation to a peer-reviewed study that documents a genetic bottleneck increasing diversity in a population? That is contrary to everything that I have ever read about bottlenecks (and I have actually read a large amount of literature on this topic). Every single paper that I have read talks about bottlenecks reducing genetic diversity. Additionally, I assume that you are referring to demographic bottlenecks, because when doing population genomics studies, we don’t even consider a population to be bottlenecked unless we have document a large loss of diversity. In other words, we define a genetic bottleneck as a large loss of diversity (rare alleles tend to be lost quite quickly), so I don’t see how a genetic bottleneck could increase diversity when it is, by definition, a loss of diversity. I’m also assuming that you are referring to diversity in the truest sense, rather than allelic richness (which is actually what I was talking about in most of the post). I can imagine an unlikely scenario in which a demographic bottleneck would shift allele frequencies such that each allele had a similar frequency, but few alleles were lost (which would technically be an increase in diversity despite a slight loss in allelic richness), but that would only happen in a tiny subset of cases, which, once again, makes it irrelevant for understanding the general patterns. Are you perhaps referring to changes in just a small portion of the genome? Because that can certainly happen, and in some cases bottlenecks can indeed enhance selection for certain traits, but that is an entirely different thing from saying that genetic diversity of the population as a whole increased. P.S. I will be traveling and will not have internet access for several days, and I think that the comments on this post will close before I return, so I likely won’t be able to respond to anything that you post, but I am curious to see what studies you have read that document a bottleneck causing the genetic diversity of a population to increase.